It is often said that the youth of Bonaire know little about their island culture and its connection to the sea. 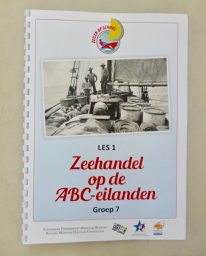 To bridge that knowledge gap, the Bonaire Maritime Heritage Foundation has developed Zeilen Op School (Sails in the School), an innovative curriculum that brings sailors, boats and nautical traditions into the classroom. Starting this year, students in Groups 6 and 7 (ages 9-11) will hear first-hand from the original crew of Stormvogel, a sailing cargo boat built on Bonaire in 1951. Six of the original crew, including a captain, ship’s cook and deckhands, describe a number of different topics from what was traded between the islands to life aboard a cargo boat; from how wooden boats were built on Bonaire to storms at sea, shipwrecks and smuggling. Through these stories other topics are introduced including geography, science and economics. 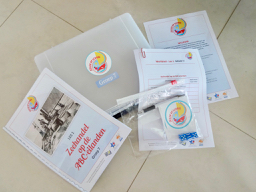 The project was made possible from funding from Fonds Voor Cultuurparticipatie, Samen Werkende Fondsen and Prins Bernhard Cultuurfonds for the Caribbean Region. 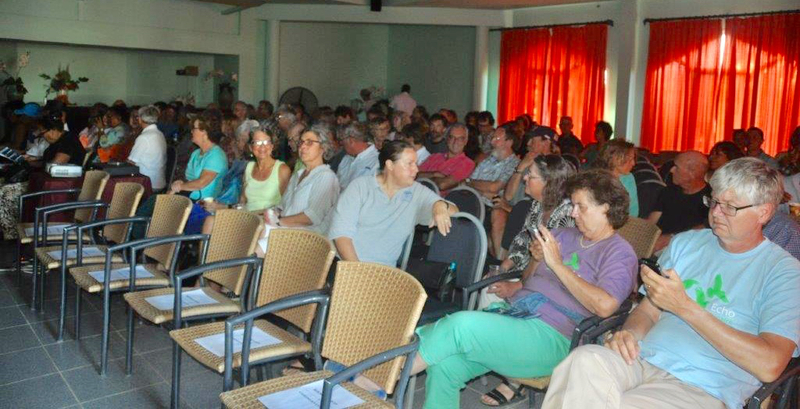 Over 150 people attended the first-ever Bonaire Maritime Film Festival last night (January 14th) at the Plaza Beach Resort. The highlight of the evening was honoring six sailors from the original crew of Stormvogel, the last of the sailing cargo boats of the ABC Islands. 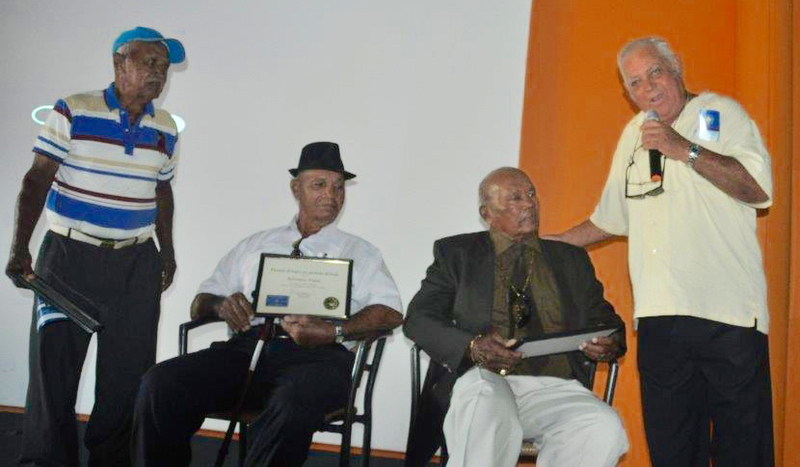 Receiving lifetime achievement awards were Ismael Soliano, captain; deckhands Lucio Soliano and Balentine Frans, and boat builder Buchi Felida who also skippered the ship on its first test sail after being launched in 1951. Luis Coffi, ship's cook, and Jan Felida, boat builder, could not attend but also received awards. The sold-out crowd also enjoyed seeing Stormvogel Rising and Vanishing Sail. Both films are stories about people saving wooden boat building traditions in the Caribbean. The Bonaire Maritime Heritage Foundation thanks those local businesses who generously donated funds to make the film festival a success. They include ABC Marine, Boto Blanku, Budget Marine, Don Andres NV, Harbour Village Marina and Wanna Dive. pecial thanks to the Plaza Beach Resort for donating its conference room for the film festival and to The Sign Studio for graphics and design support. And masha danki to the festival's enthusiastic volunteer team of Michiel van Bokhorst, Hettie Holian and François van der Hoeven. 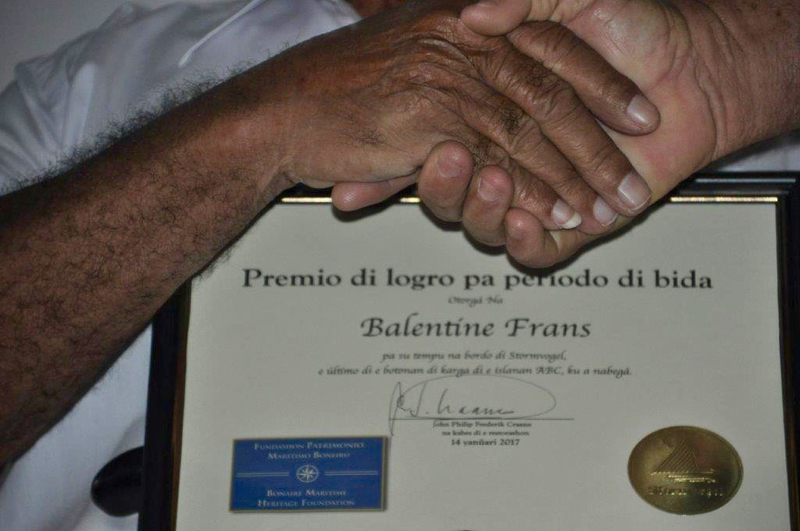 A Lifetime Achievement Award for Balentine Frans, deckhand on Stormvogel. 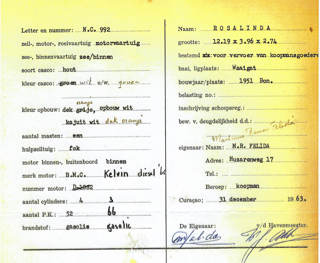 In April, Fonds Voor Cultuur Participatie (Funds for Cultural Participation) in the Netherlands awarded Fundashon Patrimonio Marítimo Boneiru (Bonaire Maritime Heritage Foundation) €56,022 ($63,610) for Project Stormvogel. The foundation has been seeking funds for the historic restoration of Stormvogel, the last of the sailing cargo boats of the ABC Islands. The 45-foot ship, built in Bonaire in 1951, was rescued from a backwater in Curacao where it was rotting. Enter the elegant foyer of the new seaside Terramar Museum in downtown Kralendijk, Bonaire and you greeted by stunning images from the maritime past—young Bonairean deckhands daringly diving from tops, burly dock workers moving heavy cargo at the Handelskade in Curaçao, and majestic three-maste ships at anchor in Oranjestad, Aruba. For the complete News Archive dating back to the very beginning, click here.